It’s difficult to get a news & notes page together when you’ve not been to a dog show for a couple of months. The good news is other people have been going to dog shows. 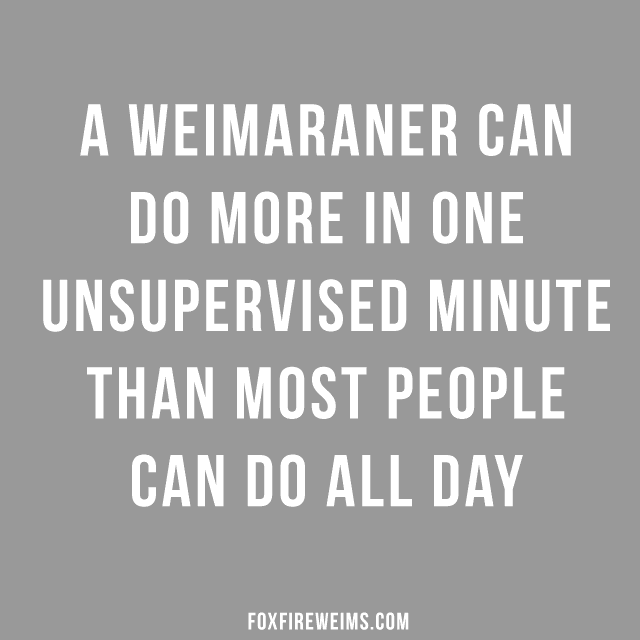 Plus, it was hunt test season – at least for one weekend. We didn’t make it to the national specialty this year which was disappointing. You might have noticed we were in the catalog but didn’t show up. LaRita had surgery on the 24th of May and was still working on recovery. She is fine. My job also needed me around that week. Hannah busted her knee. I could go on, but it just wasn’t meant to be. I didn’t cancel my hotel reservations until the 6th. Thankfully China and Sabine were there to represent us. Cathy Lester was ringside with her iPhone, broadcasting to Facebook Live. I got to watch both the Futurity and Maturity classes! Both dogs looked great! 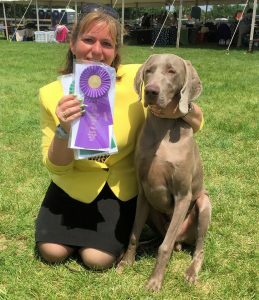 I am grateful to Steph and Susanne for showing their girls and am looking forward to seeing them both this fall for hunt tests and shows. South Dakota is on the to-do list! 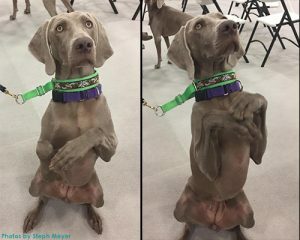 Sabine showing off some of her dog-trick skills, these include sit-pretty, bow, shake and more! 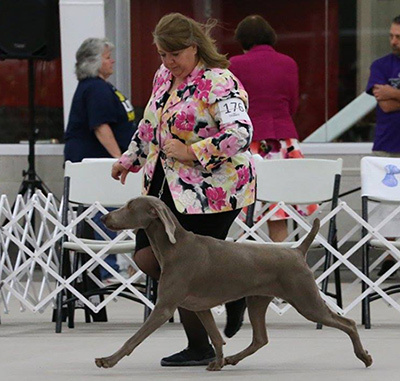 Photos of Sabine being (slightly) more serious in the show ring. 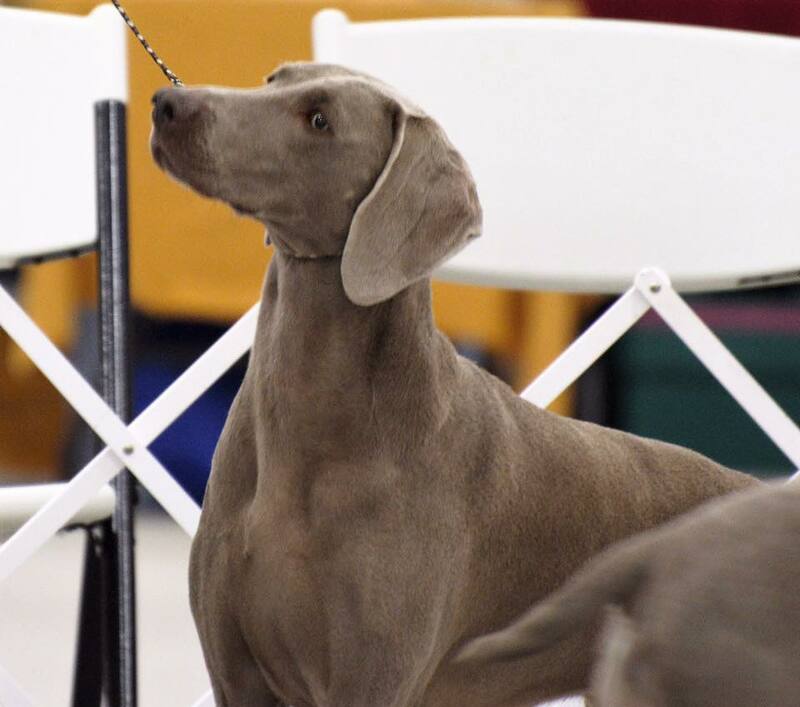 China, one of her times around the ring during Best of Breed competition. Hunt test season was brief this year, mostly due to the weather. The spring Mile High Weimaraner Club test was cancelled due to a late snow storm. It’s been a cold spring here. Thanks to Jeff and Susanne for making the trip from South Dakota even though they didn’t get to run Sabine. It was a long way to drive for dinner and drinks in Denver, but we had a great time catching up! Sabine picked up her first JH qualification a week later in S.D. 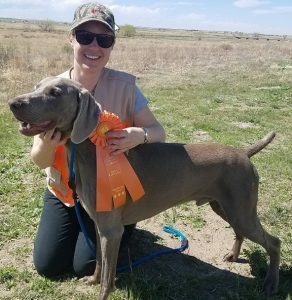 Bones also picked up another JH qualification at the Vizsla club test, getting him halfway there. We didn’t make the cut into the other tests in Colorado (entry limits) so we’ll resume festivities next fall. Jean is on the 3rd leg of her JHA, piloted by George. Reggie, our east-coast emissary, took his first points including a 3 point major and Award of Merit at the Garden State Weimaraner Club supported entry held at Plainfield Kennel Club in Freehold, N.J. Reggie is out of Dylan and Lillian, and is almost 10 months old. He is owned by Robert and Ruth-Ann Godfrey. He is a big baby boy, but very handsome! Reggie was handled by Michelle Smith Wolcott (pictured). Reggie is also an awesome swimmer. I’m still working on his page content, but there are lots of photos ! In breeding news, we were supposed to have puppies over Memorial Day, but Frankie did not conceive. Never fear, we’ll try again. We have had an above-average success rate, so when we have a miss, it seems unusual. Conception rates for the dog species are about 85% using all methods (AI, TCI, natural..). We were, apparently, due for a statistical catch-up. In the last few weeks we made the decision to breed Lillian one more time. We have the sire list narrowed down to some special candidates. We will be announcing the litter in the next week or so. Save the date, and a bottle of sunscreen for Saturday, Sept. 9 in Greeley. It is the annual Mile High Weimaraner Club specialty show and sweepstakes. The club is also planning a picnic after the show. Marnie (Ch.Foxfire’s A Lil’ Sumpin’ Sumpin’ Wild) passed away the end of March after a foreign body infection in her sinus cavity. She retired to the farm life in Utah in 2015 and is greatly missed by her owner and dog friends. She was a sweet dog, gone way too soon. 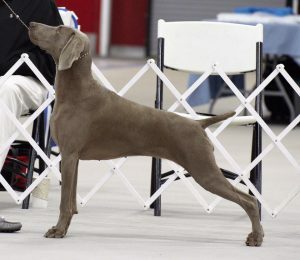 Ruby (Ch.Foxfire’s A Little Bit Of Bling) passed away on May 11th. She was our dog, and is missed greatly by everyone here. She’d dodged a few bullets and was tough, right to the end. Uma (GCh.Foxfire’s Slow Dancing With The Moon) passed away on June 3rd. Uma retired to Kelli & Tom’s house 3 years ago. She was a winner of her futurity class in 2009, a grand champion and a mom to three wonderful litters. She was, best of all, beloved by her adopted family and will be missed.